Win Odds: iOmaha Indicator win poker odds are calculated with a sophisticated mathematical algorithm based on your pocket cards, the community cards, and the number of players in the hand. iOmaha Indicator offers accurate win poker odds that you can trust. 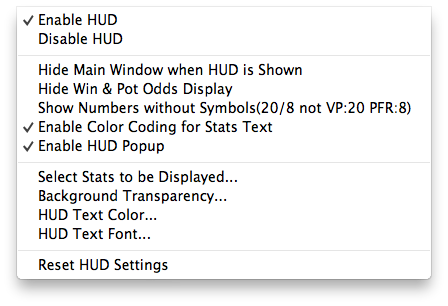 You can change the display format to "Ratio" in the settings window after you click "Options" > "Odds Display Format". Hand Odds: iOmaha Indicator displays the probabilities of hitting a particular hand at showdown for you and your opponents at showdown. For example, if it shows 20 on flush for you and 30 for your opponents, it means that you have a 20% probability of getting your flush, while your opponents collectively have a 30% chance of hitting a flush. 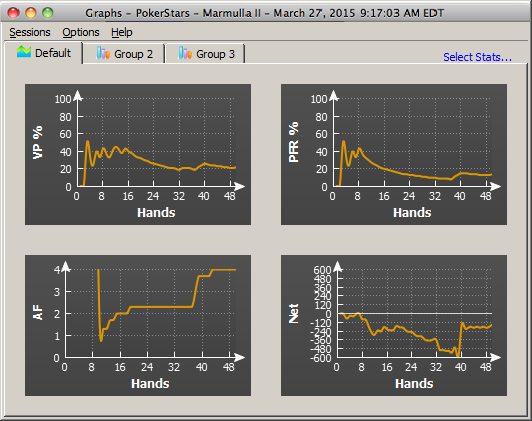 Starting Hands Strength: iOmaha Indicator provides Group, Hutchison Points and Win Odds for your starting hands. They're all independent numbers. You can choose the one you prefer to play your own starting hands. iOmaha Indicator uses "Group 1", "Group 2", "Group 3" and "Group 4" to indicate the starting hands strength. "Group 1" is the best starting hand. Please Click Here for the details. iOmaha Indicator also calculates the Hutchison Points for your starting hands. Hutchison points and the "Strength" are two independent systems. In most of the cases, hole cards with high points will be in "Group 1" or "Group 2" category. However a "Strong" hand may have lower points sometimes or vice versa. They don't always match with each other. 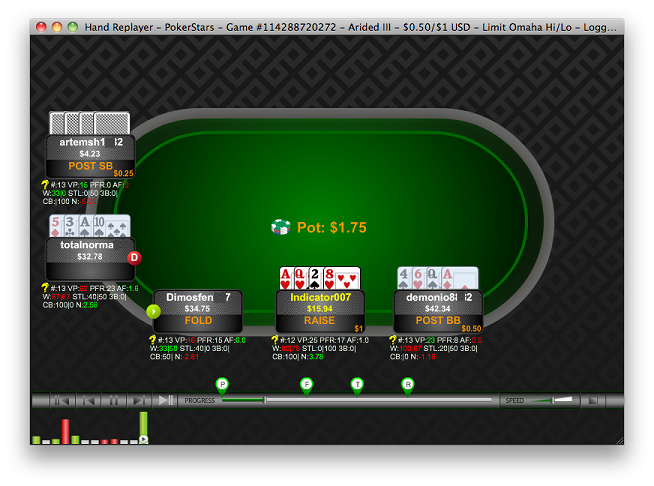 The "Group" feature is unavailable for PokerStars and Full Tilt. OUTs: OUTs refer to the unseen cards still left in the deck that will improve your hand after the flop. As you might guess, the more cards left in the deck that will improve your hand, the better. That's why, after the flop, you want to stay with hands that can be improved in a number of ways. The more outs, or ways your hand can potentially improve on the Turn or the River, the better your chances are of winning the pot. By counting your outs, you can do a very rough, quick calculation to estimate your chance of improving your hand after the flop, and hopefully having a winning hand. Knowing how likely (or unlikely) you are to improve will help you make a better decision about how much (or little) to invest in the hand. iOmaha Indicator shows you the total outs and what the outs are. iOmaha Indicator displays the OUTs from the strongest to the weakest. So you can easily ignore the weak ones if you wish. Keep in mind that iOmaha Indicator doesn't calculate Win Odds based on OUTs. They're independent. You can use either of them to judge your hand strength. Position: iOmaha Indicator shows your position after flop. For a full size table (7-10 players), the first three seats after the button would be Early. The button and the two seats before it would be Late, and in between is the Middle. For short-handed tables (5-6 players), Early and Late position are the first and last two positions. 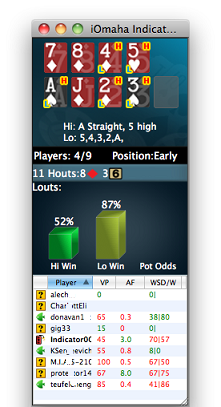 For tables with 2-4 players, Early and Late position are the first and last position. are used to mark the cards which make your Hi/Lo hands. iOmaha Indicator stores Player Stats automatically on your computer. The stats will be loaded automatically next time you're sitting with a tracked player (if you choose to display the history stats option). This data is collected using the same information you receive while sitting at the poker table. iOmaha Indicator does this by reading the log files supplied by the online poker rooms themselves. The major difference is that iOmaha Indicator actually remembers the action and automatically recalls it for you. Top professionals have amazing card memory - so can you! AF (Aggression Factor): It measures a player's aggression/passivity, which represents the player's betting tendencies after the flop. iOmaha Indicator provides a combined AF for flop, turn, and river. If a player makes some raises and bets but never calls, the AF will be displayed as Inf, which means "infinite". Red for Passive, Black for Neutral, Green for Aggressive. Below are the default settings. Profiling Icons: (This feature is unavailable for PokerStars and Full Tilt) iOmaha Indicator may assign a profiling icon to a player when it collects more than 40 (by default) hands of data for that player. Below is the list of all the profiling icons and the corresponding criteria. You can change the profiling thresholds. 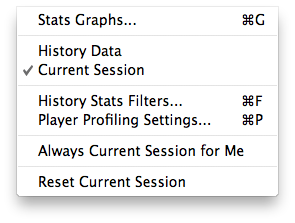 Click "Stats" > "Player Profiling Settings". 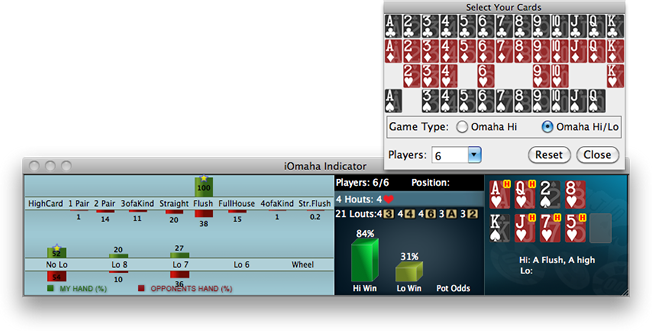 iOmaha Indicator displays player stats, win/pot odds and mucked cards seamlessly on your game table. iOmaha Indicator has a stable, smooth, easy to use HUD. No complex configuration is needed. Click the "View" menu or right click on your iOmaha Indicator. You can switch it between "Horizontal View" and "Vertical View", "Odds Display" and "Player Stats". 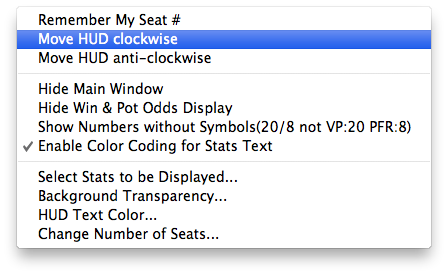 Find New Game Tables Automatically: By checking this option, iOmaha Indicator will launch new instances automatically for your new game tables. Move with the Game Table: iOmaha Indicator will move itself with the game table automatically when you move your game table. Four Color Deck: Displays your hole cards and the board cards with a 4 color deck on iOmaha Indicator. 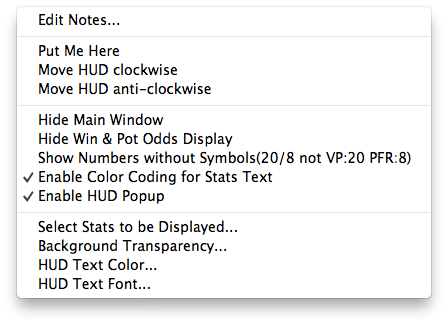 Close iOmaha Indicator when Game Table is Closed: So you don't have to manually close iOmaha Indicator every time. Resize iOmaha Indicator when Game Table is Resized. Work with Bovada/Bodog only: iOmaha Indicator will work Bovada/Bodog game tables only. Always Current Session for Me: If you select this option, iOmaha Indicator will always display your own stats for the current session even you select "History Data" option. Hide Main Window when HUD is shown: You can hide the main window of iOmaha Indicator.